Address: 80 Northcorp Boulevard Broadmeadows, VIC, 3047. Racing Distances: 525m, 600m, 725m. Bookings are required for every trial. Arm trials can be made through Fastrack or by phone, while pen trials must be booked by phoning the office. All solo trials cost $8. Monday – Pen trials commence at 6:00pm, with all bookings to be finalised by 4pm. Arm trials commence at the conclusion of pen trials, with the last trial to be run at 5:30pm. All arm trials must be booked by 12pm on the day. Wednesday – trial tickets are available through the office and are sold during the race meeting up until the final event. Friday – Arm trials commencing at 8am, with bookings to be made by 4pm the day prior. 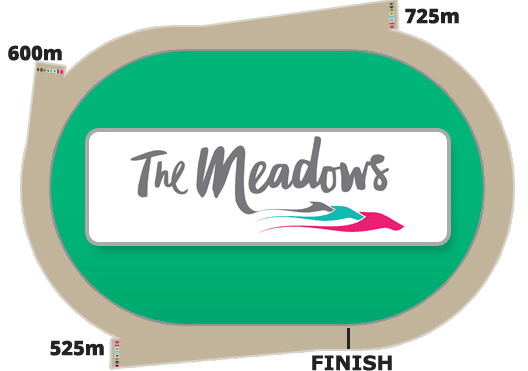 Based in Broadmeadows, just under half an hour from the centre of Melbourne, The Meadows is one of two metropolitan circuits in Victoria, the other being Sandown Park. The track is home to 14 Group and Listed races each year, including nine Group 1 races – the Maturity Classic, the Silver Chief Classic, the Bold Trease, the Topgun, the Hume Cup, the Temlee, the Rookie Rebel, the Super Stayers and the Australian Cup. The track’s history dates back to 1955 and the formation of the Melbourne Greyhound Racing Association. The MGRA’s emergence was a split from the Greyhound Owners Trainers and Breeders Association with the new entity registering themselves to be able to hold a license to operate greyhound racing. Despite holding a license, the MGRA were unable to afford the £35,000 price tag attached to the White City track where they had wanted to race, leaving them without a track to call home. To avoid causing a recess in racing, the MGRA started to conduct races at the Maribrynong track paying a lease of £100 per week whilst they simultaneously worked on plans to build a greyhound track at the Arden Street football grounds in North Melbourne. In 1957 the negotiations to allow the Melbourne Greyhound Racing Club to move to the North Melbourne Greyhound track were completed and racing was conducted using a tin hare lent to the track by the New South Wales Greyhound Breeders Owners and Trainers Association, to be paid for when it was possible. On September 11 1957, the Lord Mayor of Melbourne officially opened the brand new North Melbourne greyhound racetrack in front of a large crowd including over 60 bookmakers. It was the start of a booming few years for greyhound racing in the state. The first Australian Cup was held on the 31st March 1958 and saw the raging favourite Rookie Rebel storm to victory. The Australian Cup is still the centrepiece of racing for the MGRA to this day. Things were great for the MGRA up until 1961 when the Melbourne City Council lumped a massive increase on their annual rent from £7,000 to £9,500 per year. Believing that the rise in expected rent was too much, negotiations began within the week with the Olympic Park Trust to move the racing out of the North Melbourne grounds. The MGRA’s plan to spend £50,000 to convert the second oval at Olympic Park in Swan Street at Melbourne for racing was approved by the State Cabinet during September. The MGRA would have to pay annual rent of £5000 each year to the Olympic Park Trust or 12.5% of the gate keepings, whichever was the larger amount. The last meeting was held at the North Melbourne track on April 16 1962 – with the last Australian Cup to be won at the track won by Take A Bow. It wasn’t long before Chairman Bill Conroy had the MGRA back up and running and on a chilly night, Monday August 20, 1962, a crowd of 6,000 battled the elements at Olympic Park to see the white ribbon cut after the third event by Arthur Rylah, the Chief Secretary, and the new Olympic Park racetrack declared open. Racing continued at Olympic Park and saw some historic moments over the following decades- the first Silver Chief Classic was taken out by Barunah in 1964, the inaugural Group 1 Maturity Classic was claimed by Enfield in 1991 and in 1993 China Trip became the first and only greyhound to win consecutive Australian Cups. Racegoer numbers started to decline in the early 1990s as did the MGRA’s finances. To add to the problems, in late 1994 a part of the Citylink Project, the Domain Tunnel, was proposed to run under the back straight of the track. Originally the MGRA planned to move out of the site while the construction was taking place, only to be told by the Olympic Park Trust that they would not be allowed to return to the existing track despite having 13 years remaining on their lease. Causing more complications for the MGRA was the fact that neither the Olympic Park Trust nor the Tunnel Consortium (Transurban or Citilink) were willing to pay the MGRA compensation for terminating the lease. After lengthy negotiations, Citylink agreed to contribute funds towards helping the MGRA pay for their relocation from the Olympic Park site. For the second time in just 20 years, the MGRA were again on the move, with the location of their new track set to be at Broadmeadows. Although it proved to be a difficult time, the new site provided significant benefits for the MGRA and the greyhound racing industry. First of all, the shuffle to Broadmeadows established greyhound racing on the North side of Melbourne again, the Hume Council were wiling to make the MGRA their business partners in community development, while the demographics of the new location introduced a younger audience to the world of greyhound racing. After approximately 18 months of construction, The Meadows Greyhound Racing Track was opened on Monday February 8, 1999, with a huge crowd of 8,000 welcoming the new era of greyhound racing in the state. Greyhound racing continues at the track to this day, with meetings held on both Wednesday (day) and Saturday (night).